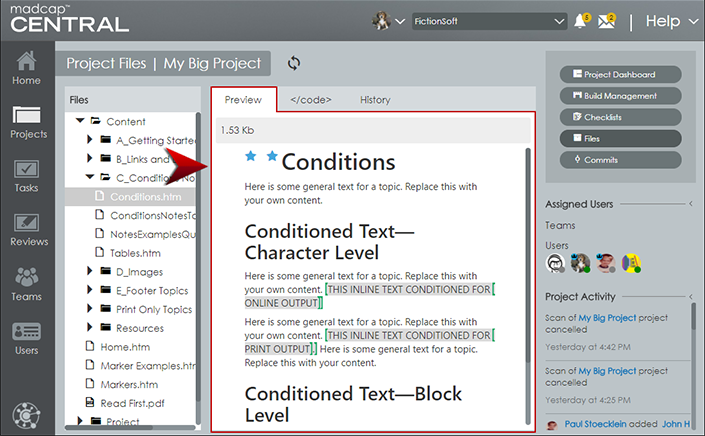 We recently announced the new releases of MadCap Flare and MadCap Central, where we introduced new features designed to streamline collaboration between technical writers and subject matter experts. With features such as a new browser-based lightweight editor, new user types, and more, MadCap Central makes it easier to plan, manage, and get your content created, edited and reviewed, no matter where your team is located. 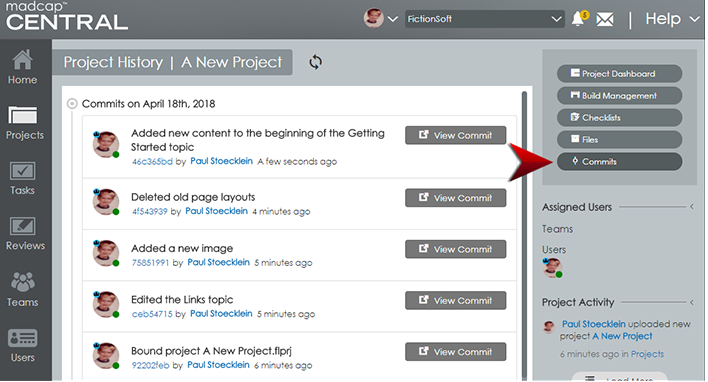 You can now add two different types of users to MadCap Central – Authors and Subject Matter Experts. The Author has full access to all of MadCap Central’s functionality, while the Subject Matter Expert has access to the parts of Central relevant for creating, editing, and reviewing content. Contribution and reviews are an essential component of the documentation process. MadCap Central now offers a streamlined workflow, where Flare authors can collaborate with Subject Matter Experts (and other Flare authors) by viewing and working with Flare content files in an easy-to-use, lightweight editor that runs in a browser. When you open MadCap Central, a new Reviews page is visible, that lets you view, edit, and add content to Flare topics and snippets that have been sent by Flare authors. A new lightweight editor is now available in MadCap Central, which enhances your workflow with cloud-based review and contribution. 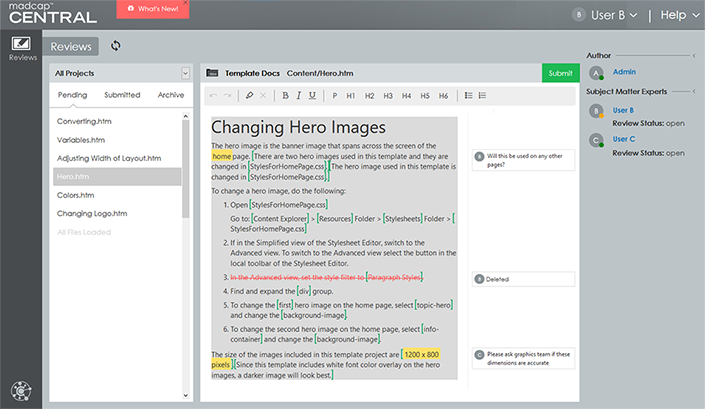 This editor enables non-Flare users to focus on what he or she needs to create or review, although this editor can be used by Flare authors as well. Collaboration, Contribution and Editing. Flare authors can send topics and snippets to subject matter experts (and Flare authors) to write content. After opening a topic or snippet in the cloud-based editor, you can edit the content or insert annotations, which are tracked and auto-saved as you work. Collaborate with SMEs (and other authors) by viewing and working with the same Flare content and projects concurrently. Annotations. Annotations (i.e. comments) can be added to the content. When the author reviews the file in Flare (or in Central), that feedback can be incorporated, and the annotation can either be kept or removed as necessary. Markers. Tags and markup in Flare topics and snippets are represented by various markers in the editor. These provide a visual cue for the author or reviewer that more than simple text is present. Conditions. When topics are opened in Central, conditions are easily identified by a grey background. Reviewers can make changes to certain content, but they cannot make changes to the condition tags themselves. Info Bar. The lightweight editor includes an info bar under the toolbar, which provides more information on the various elements (tracked changes, annotations, markers, conditions) that need review. No Desktop Software. Subject matter experts don’t need to install or download any software in order to access the new features. Reviews take place in the cloud on MadCap Central. Concurrent, Multi-User Editing. 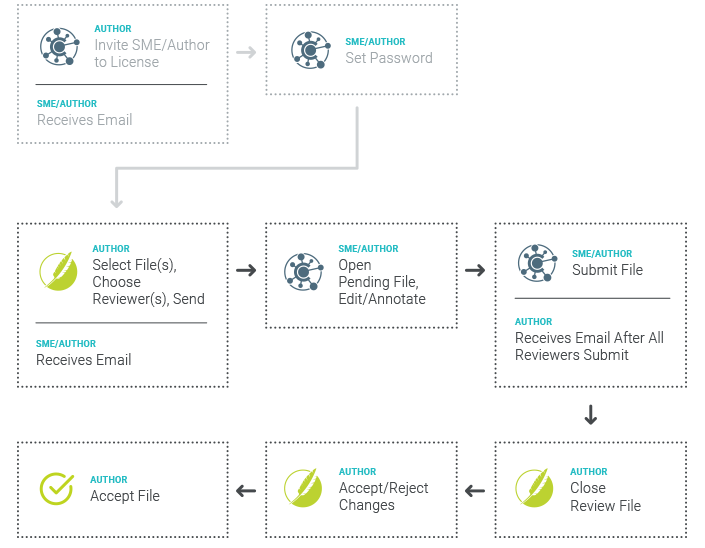 Does your documentation process involve multiple reviewers? Review files can easily be sent to multiple users, and changes can be made to the same file, at the same time. Streamlined Interface. 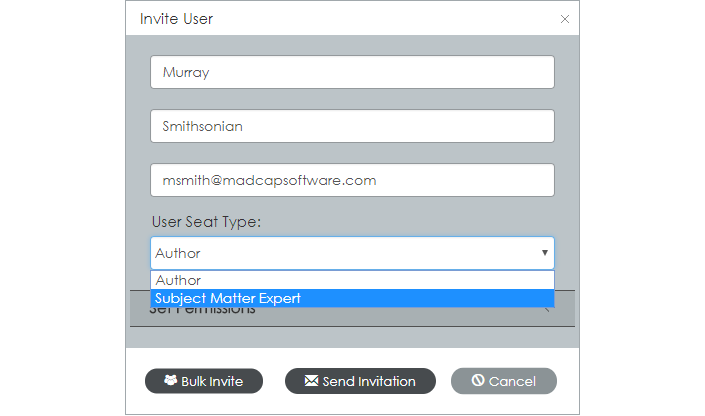 When users are assigned as a Subject Matter Expert in MadCap Central, they only see the features that are relevant to the review process. This allows for a streamlined approach, narrowing down on exactly what they need to see. Auto-Save and Tracking. Changes in the editor are auto-saved as you work. In addition, all changes are automatically tracked so that the original author can easily locate edits for approval or rejection. 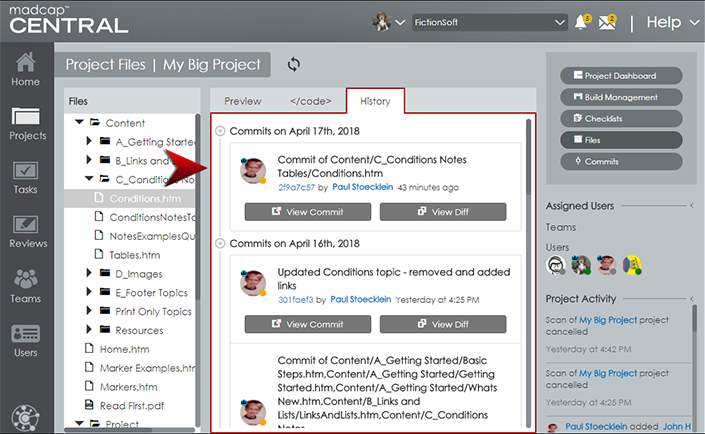 The May release of MadCap Central also comes with additional features, such as a new Files view and the new Commits view. When you open a project in Central, you will no longer see the “Repository” option on the right side. The “Files” option has taken its place. This lets you see a read-only view of all files in your project. You cannot make changes to files on this page. You can only view them, their contents, and information about them. The file will not look exactly the way it does in the Flare project. Content files (e.g., topics and snippets) display in much the same way they do when viewing them in the lightweight editor on the Reviews page. In addition to previewing the content, you can view the code of the topic, as well as the history of all of the file commits, with the most recent commit at the top. If the user added a comment when committing the file, it is shown next to that user’s avatar. If the user did not add a comment, the path of the file is shown instead. A commit is a group of changes in a local Flare project that are pushed up to Central in order to keep the files synchronized. If you want to view details about your commits on Central, you can open the Projects page, then click Commits on the right side. All of the commits for the project are listed, with the most recent one at the top. Take a look at our What’s New topic to see the full rundown of all the changes. Looking to learn about the new features and enhancements waiting for you in MadCap Central? Over the course of the hour, Jennifer Morse, Director of Product Evangelism, and Justin Bondoc, Sales Engineer II, will provide an overview of the benefits of working in MadCap Central, as well as a comprehensive look at the latest new features and functionality added to MadCap Central. We hope you enjoy the newest release of MadCap Central! If you have any questions, feel free to contact me: jmorse@madcapsoftware.com. I would like to make a review package for an entire folder — including subfolders — without selecting one file at a time. (Someone named similar functional files with the same name and the review copy sorts on the file names, making it a very illogical order.) Is there a way to do this? Hi Carla, you can use the Toggle Show files button to multi-select files and send them for review. Also, you can use your TOC to multi-select files for review – if the files and you want to send have been added to a TOC. If you do choose one file for review, you can also use the plus button in the wizard to multi-select other files from your content explorer too. I will submit your request to R&D to be able to multi-select files and folders from the content explorer and send them for review with some control on the order, without having to toggle show files.